A break with coffee/tea and cake! A cozy get-together does not necessarily need a special occasion. 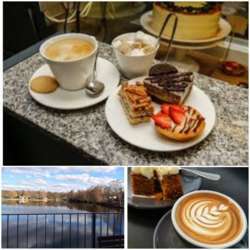 It's also nice to just invite you for coffee and cake on a nice Saturday afternoon in a idyllic place in Darmstadt. You can also order something else than coffee, tea or cake. It is more about spending a few hours in a good mood and enjoying the week-end. You can invite and bring some friends.